Two posts ago I mentioned ‘If I was to be stranded on Dessert Island… it would be a plant I would take! Mm… that might be a good subject for a posting – I may come back to that one.’ Well here we are and the initial one plant has become three and by gosh this was so much harder that I ever expected! Given the criteria ‘no limits to growing conditions whatsoever’ and with the assumption that food was on the Island this completely opened up the game. A plant from any country was now on the cards. Argh… too, too much choice! Okay, seeing as this posting is acting as a host for others too I’ll try and keep mine fairly brief. My one plant was a complete no-brainer. It would be a foliage plant. A tactile one with height, movement and some sound as the wind gently blows through it. Choice number one is a Bamboo, a bambusa, the clump forming type of bamboo which is not usually invasive. 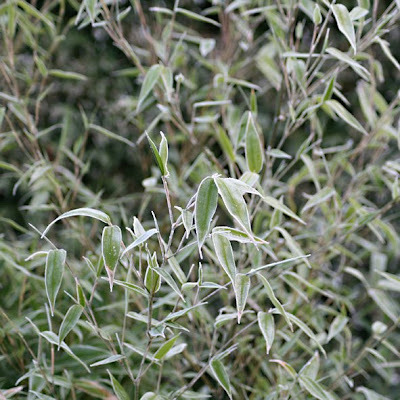 I would take a large specimen and consider dividing it before planting it. Above you can see some frosted leaves on one from my garden and a specimen courtesy of Wikipedia. Plant number two had to be a tree. I love large trees but there is just no way my small garden could ever support one. A Desert Island could so… after a great deal of deliberation there was only one choice. I would have a huge, mature, weeping cherry tree. Ah… dripping with blossom and filling the air with its scent - just wonderful. Next, my thoughts went to flowers on the ground. Oh my… I went round and round the houses on this one. So many books were opened here. This is where I really struggled! Mail came in saying other bloggers were going to take part and let’s just say panic set in. However, ground cover was my first thoughts for this one and my first love of alpines kicked in. However, on browsing I discovered something that really caught my eye and I started thinking about wild flowers. Before I give you my final selection I would like to share something else with you. The photo above doesn’t look that exciting perhaps at first glance but this is the Machair on Berneray in the Outer Hebrides of Scotland. Reading from Wikipedia where I found the image above: ‘Machairs have received considerable ecological and conservational attention, chiefly because of their unique ecosystems. 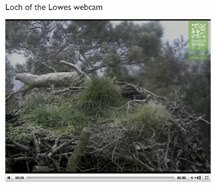 They can house rare carpet flowers, such as Irish Lady's Tresses, orchids and Yellow Rattle along with a diverse array of bird species including the corn crake, twite, dunlin, redshank and ringed plover, as well as rare insects such as the northern colletes bee. Some machairs are threatened by erosion caused by rising sea levels as well as by recreational use of vicinity beaches.’ Notice there are no trees. My searching then took to me to rare wild flowers for a while but I decided just one wouldn’t be enough. My Desert Island couldn’t have its own Machair as that would be cheating and my tree and bamboo would spoil its habitat. 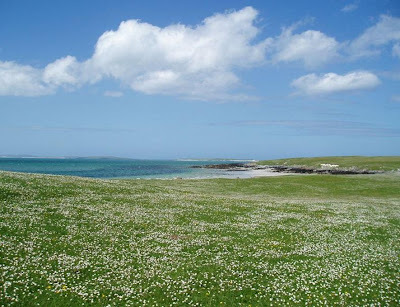 However, just imagine a Machair with wild flowers from all over the world. Now wouldn’t that be something! Small simple flowers have always won me over. So, so many stuning flowers in the world and I have chosen a very simple plant. Also, its one I can’t grow succesfully outdoors in my own garden despite following all the advised planting methods. Ah… but any plant will grow in this Desert Island! The third plant to come with me to this Desert Island would be a Lewisia, not one that shouts out with a rainbow of colours either. To me, rediviva, the one above has beauty on a whole different level. I would never tire of plants like this. What a picture this would be spreading around the Island. My picture is complete and I am eager to see what everyone else has chosen so I won't keep you any longer! Very quickly, I would like to say a huge thank-you to everyone who has helped pass around the word with this. Thanks too, if you have posted. I do love postings like this. If you'd like to add the link of your posting below we can all pop by to see your choices. Another option is to leave a comment if you don't have a blog or don't have time to post. We'd all love to hear about them. Although this has been hard it has defintiely been fun - I hope you've enjoyed it too. Just one final thing. I'll keep this posting up right through the weekend for anyone still wishing to join in. 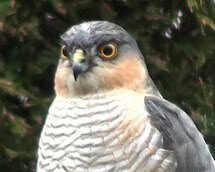 I'll do my bird count posting on Monday evening. 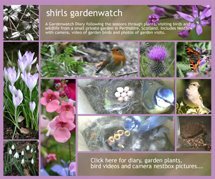 This post was written by shirl for shirls gardenwatch. All photos above with the exception of the first one were taken from Wikipedia and all licences can be seen via the links given. My head has been hurting (well, not really) trying to decide which would be my desert island plants. I'll post the results later, but I love your three choices! We have a few wild Lewesia's in Washington State and we always enjoy them when we see them. Nice choice. i'm still thinking, shirl! but i enjoyed your post and your choices! A great idea, Shirl, and you came up with three neat choices! This was really fun. My post is up at Gardening Gone Wild. Good luck with your bird count this weekend! I see you've got a great response already. I know you've said there's plenty of food on the island, but I just might add an allotment based response to make sure we have some things we actually like to nibble on if that's OK? I've also posted my 3 choices. That took more thinking than I expected! Jane x"
Shirl, My ship is sailing right now toward the desert island, with my three plants. Thanks for setting this all up! Great choices, Shirl. We were thinking along the same lines regarding wild flowers. ;-) I've made my decisions and my post is up at Bliss. Hi Shirl, I can see that this is a big hit already! Way to go! I am too excited to see what everyone has chosen too. Thanks for thinking this up. I will be back when I have recovered to look at everyones choices, and read yours properly. Yolanda, thanks so I see! What are you like ;-) I’m expecting you’ll get a few visitors! Great to see you’re taking the plunge with a pond too – looking forward to seeing the final water feature!! 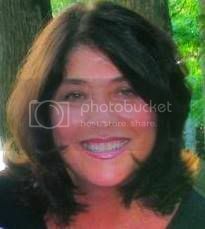 Hi Shirl: I forgot to add my link to your post, so thank you for doing it for me. I LOVE this discussion--it's so cool to see what other plant fanatics would take with them. I guess if I was going to be stuck on this island, I'd have to cheat and find a way to take all of these with me of course, because it really IS a challenge to narrow down to just three. And everyone has such good choices, don't they? Shirl, this was a more difficult task than I expected. I think it will be great fun to see all the different plants that people will bring along. Wouldn't it be magnificent to see a garden with all the picks growing in it?? Hi Shirl, what an excellent idea. Great 'escape' from a grey January day. This is the first time our paths crosses and I must say I'm impressed of you blogs. It's neat seeing the different routes! Okay Shirl, How do I delete my extra links on your link widget?? Ah, figured it out. Shirl I love your choices and the reasoning-rare plants and moving in the wind. Pretty neat. Hi Shirl - I've been meaning to do an allotment version ever since James' desert island, so your challenge is the perfect excuse! It'll be tomorrow as I'd already scheduled my GGW Design workshop label post for today. Shirl, I find it great that we picked the same first plant. I did pick it before I saw yours (found the challenge from Frances). Lewisia rediviva is native where I live, but I've never seen it growing anywhere. I've been thinking about trying to grow it myself. I’m bringing Sequoia sempervirens to remind me of the California coast range, Lupinus albifrons to remind me of the California central valley, and Ceanothus lemmoni to remind me of the Sierra Nevada foothills. I found your blog via all those "desert island" stories on other blogs! What a wonderful blog (and challenge) you have. Since I already had a guest blogger for today, may I join this meme on another day? Shirl, This is a very fun challenge. I will have to work on this later but will try to get something up by tomorrow. I don't really want to read all the comments either until I pick my three. On first thought I think my three will be easy as I can think of three in my own garden I wouldn't want to live without... we'll see though when I have more time to think. Great fun! I DO like your choices and the contemplation behind it. I see that I would love to be on a desert island with all these gardeners. It would be so beautiful! I'm back again Shirl, I have had a delightful time exploring everyones "Desert Island Plants" Good to know we both picked Bamboo - although different varieties. That cherry tree is a real stunner, and the Lewisia, you have chosen is a delight. If the desert island was big enough to hold all of us, and all our plants - and not forgetting Yolanda's Water feature ;) I think we would have a really, really good time. 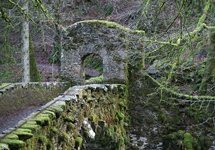 Thanks so much for hosting this, it is fun - off to catch up with some more posts now. Thanks for this fun activity, and we both choose bamboo! Lovely choices Shirl, I know just how tough it was to choose and I'm pretty sure I'll soon think of other plants I really needed to have... Damn, some already popped into my head! My three choices, Shirl...1. A liqidamber tree, 2. wild poppies, 3. geraniums. Right now I'm going nuts trying to figure out where my real plants should go. No brain cells are left over for desert island decisions....but it will be fun to see what everyone chooses! Thank you so much for this fun challenge! I love seeing the variety of plant choices out there in blog land. You do realise that if everyone was on this island with all their plants, it would be a pretty huge island. A very delightful one though. I am a simple girl so have chosen 3 simple plants: Poppies for the pure joy they bring, Nasturtiums for their wonderful colour and ground cover (as well as being edible), and finally something with a bit of class, a wisteria for a bit of height and decadence. Now I will go and read everyone elses choices! Shirl I have been in remiss in not leaving a comment on your selection girl ! 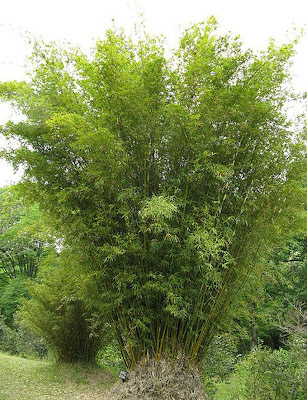 I love the bamboo choice .. we have just been able to get some in our zone .. "Green Panda" a clump forming one .. I planted it last Autumn and I am so excited to see if it has taken in the Spring. A tree for sure and yours is a beauty. I have Lewissa (Little Plum .. I think) and it is such a beautiful little gem in the garden ! Great picks girl ! I love your three choices. Well done! #1: An ancient Walnut Tree for shade & nuts. #2: Some climbing muscadine grapes for fruit, drink and more shade. #3: Lavender for color and scent. Shirl this was a hard task having only three choices. I finally narrowed it down to three and just posted them. This was a cute challenge. It is tough to pick one small ground flower when you want a whole meadow of them. The Lewisia is sure gorgeous. It may be tomorrow in the UK already. 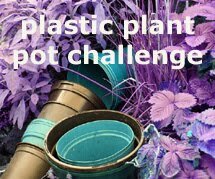 I managed to finish a Plant Challenge post for today in the USA. Whew! Finally...I've been thinking about this ALL day, and I finally finished the post! Now all we need to do is find that desert island!! A very enjoyable post and a worthy challenge. I like your choices! I responded with a post on my own favorites here at home. It was too difficult to select only three, so I decided to sneak in some zinnia seeds for the fourth plant. This was fun to do and even more fun to read other people's choices. Hi Shirl, I love your choices, bamboo came in as a runner up for me. SHELTER! Anyway, I've used you mr linky and my post will be up for Friday. Boy, picking just three was hard, so I bent the rules slightly and chose "poppies" in general as my second pick. But I think if it was Groundhog Day and I woke up again tomorrow and discovered this blog afresh, I'd probably pick a completely different trio of plants. Good fun, though, and interesting to read everyone else's choices. Shirl, I didn't have time to make a post, but off the top of my head here's what I would choose. 3. A plant to attract birds and butterflies, in order to lift my spirits: echinacea. Now all I'd need is a volleyball to make a "Wilson," like Tom Hanks in Castaway. What a difficult task you gave, Shirl, but a challenging one! I really had a sleepless night too ;-) ! It's almost impossible to stay with three plants only. One thing for sure is, a tree must come to the Desert Island and I'd probably choose the birch. A rambler rose would be its neighbour and the soil would be covered with a peony. All plants are connected with unforgetable and wonderful memories. If I had to choose according to my particular likings, then the list would be different. And if it had to be a reasonable choice the list again would look quite different too. I think the best thing for me is, not to go to the Desert Island and stay where I am ;-) !!! It's fun and interesting to read what kind of plants other people bring along to the Island :-) !! Welcome, Pam I am certain you will find many garden blogs that will catch your eye through this posting but let me introduce to a few more places to discover heaps of garden blogs. Next to an even bigger audience of garden bloggers – if you are ready for it! This time you need to submit your blog and join this group but it is easy and the rewards… well I’ll let you discover them for yourself. Everyone there is very friendly and very quickly you’ll meet many like minded bloggers. Just keep an eye on the time! 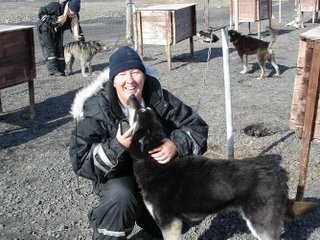 Hi, I am new to the garden blogger world and reading everyone's ideas has been so interesting. I have made a post on my three choices, three flowers for me, the ones I can't live without. This is soooo much fun, Shirl! I've been too busy to play along, but hope to get caught up with you--and maybe post my own "Desert Island 3"--this weekend! Just posted. I arrived to your blog via Tyra's blog that I follow. Too much to do now, but will be back to check out all the comments and blog entries. What a great idea to cure the Mid-winter Blues! Thanks for hosting this. I like your choices, they are so different from mine. I think that's the best thing about this meme, the choices are so idiosyncratic. Bamboo seems to be a favorite of several people; I've never tried to grow it. I will keep it in mind that the clumping kind is the best--NOT the running-rooted kind...I've heard how invasive that can be & impossible to stop from taking over. Your little flowers at the end are quite sweet. Never heard of them, but they are a very nice choice. This is going to be a grand event when we all get there! Shirl! what a wonderful idea! I love creating posts which encourage other bloggers to join in. A great place to meet other garden bloggers, thank you! 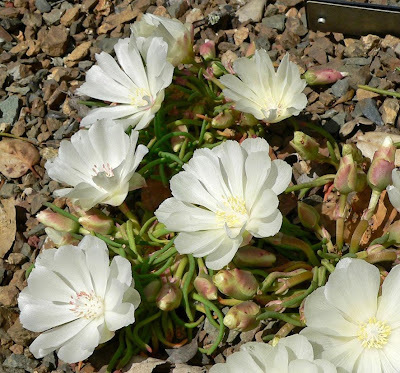 I love the Lewisia - I hadn't come across them before. It has been so much fun island hoping with everyone. Some beautiful islands! This was a tough challenge, Shirl. :) It really required a bit of thought, there being so many plants one would like to keep with them. As hard as it was ;) I finally did it- course I was busy all day and didn't even know what was going on until well after dinner! I've so enjoyed this- thanks! I have made my choices! It's a good thing one doesn't need to do such choices in real life..! "Since I Missed the Boat, I'll Have to Swim..."
to the desert island challenge. Thanks for suggesting this, Shirl! I'm a little late joining in, because I've been reading so many other posts and trying to choose just 3 plants. It has been fun to see the variety of plants that everyone has chosen. Thanks for finding the time to stop by for a visit (you busy girl, you! 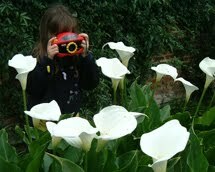 )- I'm glad you enjoyed it- I'm off to read what others have come up with- happy gardening! I've made a post with my three choices. This was a great idea, Shirl! After entering the desert challenge, I came back to really check out your blog and realized you were from Scotland. While growing up in Detroit, my next door neighbors were and elderly couple from Scotland, Hugh and Sarah McLaren, and made such an impression on my life. 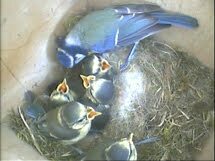 Being incredibly shy, they took me under their wing and spent alot of time with them. I'll never forget their smiles, Hugh's laugh and their kindness through my awkwardness. If I ever have a chance to go abroad, Scotland is the one place I've always longed to visit and remember the McLarens. I just posted my choices. 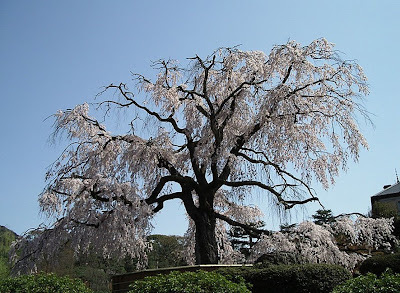 I love the pic of the weeping cherry tree! How I would love to have a weeping cherry tree! -This challenge has been really fun...and hard! It wouldn't surprise me if I regret my chocses by tomorrow! Oh dear, my Mr. Linky kicked me our of the club. I'll promise to do better next time. Nancy – Yes, it was and much harder than I expected too! It was very interesting to read how everyone made their picks wasn’t it? Dear Shirl ... after replying with an early comment and now reading all these wonderful posts, I know I might regret it but would love to invite all over to my woodland tent for a glass of May Wine (that is if I can sneak pocketfuls of Sweet Woodruff past the official counter of '3' ... now, what are we all going to eat? Great idea for a neme. I especially like your third choice -- it's lovely. Cool blog. I recently started blogging. I see now that I need to take a lot more pictures this summer. What a fabulous success your challenge was, Shirl! Isn’t amazing how an appreciation for plants and flowers can bring together so many kindred spirits. Good job! I look forward to reading more of your posts! I might be a little late with my plant picks for the island, but I will leave them anyway. My first choice would be mountain dogwood (cornus nuttallii), showy penstemon (penstemon speciosus), and my beloved California poppy (eschscholzia californica). I hope I can figure out how to subscribe to your blog. Day late and a dollar short, but my choices are over at www.pleasanthillramblings.blogspot.com. Thanks for the challenge, Shirl! Cheers! 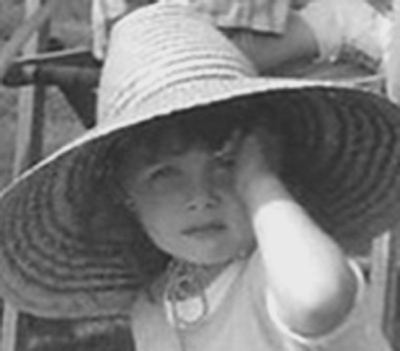 Hi Shirl - I've posted another one today as yesterday's post research revealed Graham Stuart Thomas, Beth Chatto and Christopher Lloyd were set a similar challenge a few years ago. It seemed a pity not to add their choices to the mix! What a great challenge Shirl, thanks. My three choices were a myrtle beech tree (Nothofagus cunninghamii) which is temperate rainforest tree; pansies for something to chat with; and an orchid (Coelogyne cristata ‘Alba James’) to give me something to fuss over. So interesting to see other gardener's wish lists! You said there would be food on the island so we didn't have to go with edibles, but my favorite plants produce food. I love olive trees. I'm too late to add my three plant choice to your blog but I have posted it on my blog. It took me forever as I kept changing my mind. Great challenge, and wonderful choices from people.